Strengths: Alexander Ovechkin is a passionate all-around power forward with remarkable goal-scoring capabilities. He is strong, defensively conscious, and plays the physical game really well. Ovechkin is a once-in-a-generation talent for his NHL club and for Russia. Weaknesses: Ovechkin can have a limited presence in a hockey game and may find himself playing decreased minutes of ice time. Ovechkin can also be prone to making dangerous physical plays, putting himself at risk of injury. Ovy’s scoring rate has been inconsistent in the past few years. Biography: Alexander Ovechkin has it in his blood not only to be a superstar athlete, but also a champion. His mother Tatiana won two Olympic gold medals in basketball and his father Mikhail was a professional footballer. Alexander, however, became obsessed with hockey from the age of two. He began playing when he was seven years old, but hard circumstances forced Sasha to abandon the game for two years. 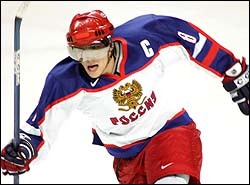 With the support of brother Sergei and coaches, Ovechkin continued to develop his hockey skills with the Moscow Dynamo organization. While only sixteen, Ovechkin was already making headlines in the hockey world for breaking the scoring record at the Under-18 World Championship. He scored two hattricks in his first Under-20 World Juniors, leading Russia to a gold medal finish. At seventeen, Alexander became the youngest to ever play and score for the Russian senior national team. Since 2005, he has developed as Russia’s top weapon at the Olympics and World Championships. 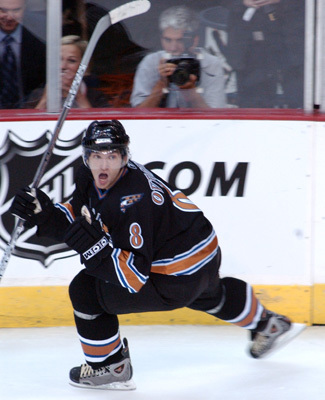 At the club level, Ovechkin continued to shine with Dynamo until he was drafted by the Washington Capitals as 2004’s number-one pick in the NHL entry draft. In his rookie NHL season, Ovechkin rose to unprecedented heights. As one of hockey’s best players, he won the Calder Trophy (rookie of the year), scored over 50 goals and over 100 points (third in the league), scored one of the most creative goals in hockey history, and became the international face of the game – all in one year. In 2007-08, Ovechkin scored more goals in a single season than any other left wing in NHL history (and won the scoring title too)! In both 2008 and 2009, he received the Hart Trophy as the NHL’s most valuable player and the Lester. B. Pearson Trophy as the most outstanding hockey player as voted by NHLers. 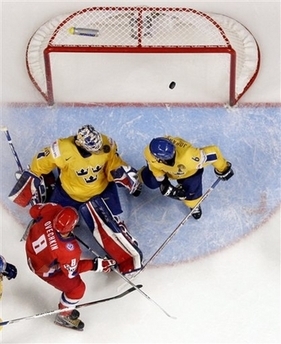 After helping return the Capitals to the playoffs in 2008, Ovechkin joined his teammates Alexander Semin and Sergei Fedorov to form the most dangerous line of the World Championship, propelling Russia to its first gold medal in fifteen years. 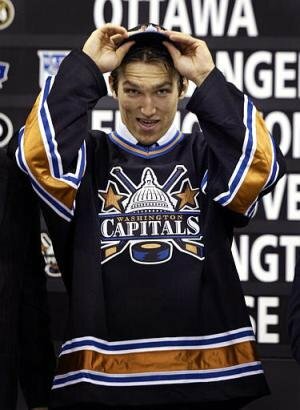 The 2009-10 season was a heartbreaking one for Ovi, as he did not lead Russia to an Olympic medal, his President Trophy-winning Capitals got eliminated in the first playoff round, and a few NHL games missed due to injury and suspension caused him to narrowly miss out on winning the goals and points scoring races. The following season presented new challenges to Alexander, including having to play while nursing injuries and a new defensive playing system implemented by Capitals coach Bruce Boudreau. While Ovechkin’s goal-scoring declined, his overall style of game matured. The next Capitals coach, Dale Hunter, continued to implement a defense-first style and freely limited Ovechkin’s ice time, especially in the 2012 playoffs. After another second round NHL playoff exit, Alex immediately accepted another invitation to join Russia at the World Championship. 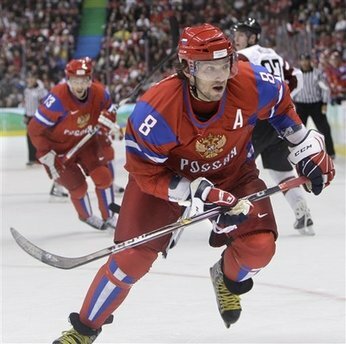 With Caps teammate Semin and centre Pavel Datsyuk, Ovechkin’s line was the strongest as Russia steamrolled through the elimination round to win the gold – Ovechkin’s second. During the NHL lockout of 2012-13, Alex returned to play for his hometown team, Dynamo. Although he didn’t get a chance to play in the KHL playoffs, Dynamo went on to win the Gagarin Cup and Ovechkin qualified to receive a championship ring, having played over half the season for the team. With the NHL resuming in January 2013, Ovy had a strong bounce-back campaign and led the league in goal-scoring, winning his third Rocket Richard Trophy.